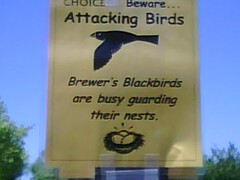 Another Kind of Nerd: Attacking Birds! Couple of things: first, a bird dive-bombed me in the grocery store parking lot. Twice. I had to take a picture of the warning signs put in place by the thoughtful people there. It was entertaining, if not a bit disconcerting. Second, I make my own attacking bird! trip down to the Bay for Big Doings and important visits. I anticipate a major Hug Atttttttaaaaaaaaaaaaaaaaaaaaack. And I anticipate being ridiculously full as A! gets her notorious Old-World-force-feeding on. I'm definitely not complaining, because everything is always SO delicious. But one must be mentally prepared for such a feast. Its very much like preparing for Thanksgiving. One should eat breakfast (check!) and one should also have some form of noon hour bit-to-eat (banana! check!). Oh, one more thing. Yay Dad! Thanks for everything! You are welcome! You're the best! In California I dream of snow.